Each weekday, Tim will take a look at what we know about each of the upcoming 52 new comics from the September DC relaunch, one series at a time. Today: OMAC! The Concept and Characters: Now here’s something different from everything else coming out from DC this fall. A complete reboot of the once-ridiculed-but-now-beloved Jack Kirby Bronze Age comic that featured Buddy Blank, aka OMAC, the One-Man Army Corps. In the Jack Kirby original, which only lasted eight issues, but has since been collected in a sturdy hardcover edition by DC, OMAC tells the action-packed story of The World That’s Coming, by providing page after page of high-tech insanity and Pseudo People and Global Peacekeeping Agencies and Brother Eye, the sentient satellite. Here’s a fact: Jack Kirby created almost the entire Marvel Universe as we know it, from the Fantastic Four to Captain America to the X-Men to the Hulk. Then when he hopped over to DC in the 1970s, creating characters like the New Gods, Mister Miracle, the Demon, and OMAC, he crafted some of the most amazing comic book pages in the history of the medium. Unfortunately, his operatic storytelling and overblown dialogue baffled some of the readers (and executives) at the time, and DC was unwilling to give him a lengthy run on anything besides his Planet of the Apes-inspired post-apocalyptic Kamandi series. 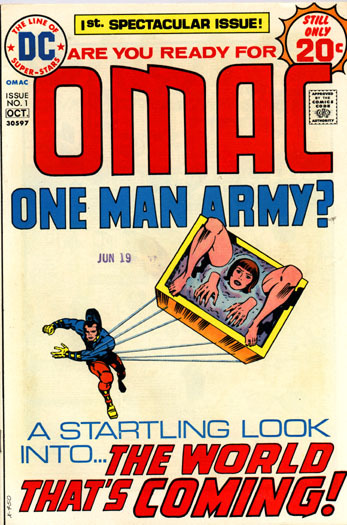 OMAC was one of his less-fondly-remembered ideas for a long time, until a recent revival of interest in Kirby’s DC work with the advent of the hardcover collected editions. The Bronze Age OMAC is pure Kirby, and you either like pure Kirby or you don’t. I happen to think it’s some of the best comics ever created. Transcendently good. This new OMAC series attempts to channel that kind of Jack Kirby energy. It can’t be pure Kirby of course, because Kirby has long since left our world behind. So it’s filtered Kirby, but the good news is that it’s filtered through Keith Giffen’s sensibilities, and if there’s one man I’d want to revive insane Jack Kirby ideas, it would be Giffen. But what’s the concept of this reboot? Well, unlike the Kirby original, this OMAC takes place in the current-day DCU. In recent DC history, Batman created Brother Eye, basically, as a potential defense against superhumans-gone-bad. And Brother Eye went bad, and started turning humans into monstrous robotic things called OMACs. None of that stuff really matters, and most of those stories were not very good, so the only thing you need to know is this: the Keith Giffen reboot of OMAC starts fresh. But it uses the idea that there’s this satellite that turns humans into monsters. And some government organizations are involved, like Checkmate, and individuals like Maxwell Lord. The New DCU relaunch was missing its tank, its monster, its Hulk. So DiDio brought in Giffen to do a Kirbyesque OMAC. And the preview pages look like four-color adrenaline, injected onto paper. The Creative Team: Keith Giffen has had a long career in the comic book industry, starting off doing a kind of Kirby riff 30 years ago, on books like Marvel’s Defenders, then pushing the boundaries of superhero art in the 1980s by bringing influences from South America and Europe into titles like Dr. Fate and The Legion of Super-Heroes. As a writer, he helped kick off the memorable bwa-ha-ha era of Justice League International, and worked on everything from the hilarious satire of Ambush Bug to the earnest revamp of the Blue Beetle. His recent return to drawing comics in the Outsiders has shown that he’s back to channeling Jack Kirby, but in even more epic fashion than before. Giffen has had plenty of missteps in his career, but the overwhelming majority of his work has been inspired, fascinating, and certainly worth reading, whether he’s writing or drawing. But, and here’s a gigantic qualifier, Dan DiDio is co-writing this series. DiDio has written comics in the past (most recently, the Outsiders series to which Giffen contributed a few issues of artwork), but he has demonstrated almost no facility for it. His comics are tone-deaf and awkwardly structured. It’s uncertain what his role is as co-writer of this series. Is he helping to generate story ideas and handling the dialogue? If so, watch out. If he’s just co-plotting, then there’s nothing to worry about, because Giffen can smooth out any of the story problems himself. Recommendation: Buy it. Definitely. It may be a disaster on the story level, and the dialogue may be clunky if DiDio ends up scripting, but even if it is, the artwork will make this one of the best-looking comics in the fall. It may not be pure Kirby, but it’s pure comics, full of panels that will seem to burst off the page, and pages that will barely be contained by the staples. If you want sensitive, subtle storytelling, this isn’t going to be the one for you. But if you want comics full of madness and enthusiasm and bombastic energy, you can’t go wrong with OMAC. And who knows, maybe the story and dialogue will actually be worthwhile, and then this comic would be unstoppable!